Make time during the streamlined, two-day conference to explore the industry’s largest annual international event, and you’ll be on the road to a stronger, more profitable and competitive business. The IAOM Expo has the hottest trends, materials, equipment, techniques and information you need – all under one roof. 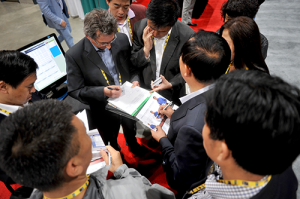 The packed exhibit floor offers the latest products and services at over 230 exhibit booths. Thousands of industry professionals rely on the IAOM Expo each year for the latest happenings in milling. For more information about exhibiting and sponsor ship opportunities, please contact dme@iaom.info or complete the contract found in the exhibitor prospectus below.